In this article, we’re going to look at the process for automatically applying further products to your affiliate when they sign up and get approved for a product in your account. This can be exceptionally helpful if you have multiple products and you want affiliates to be able to promote all of them, but without needing them to sign up for each product individually. Affiliates can sign up for Product A and then automatically be approved for Product’s B, C, and D, etc. The first step will be choosing your ‘main product’. This will be the product where you send affiliates to sign up for initially. This product will be the ‘trigger’ that then starts the automatic approval to other products. You will be sending all your potential affiliates to the URL to sign up for this products affiliate program. It’s exceptionally easy to set this up. 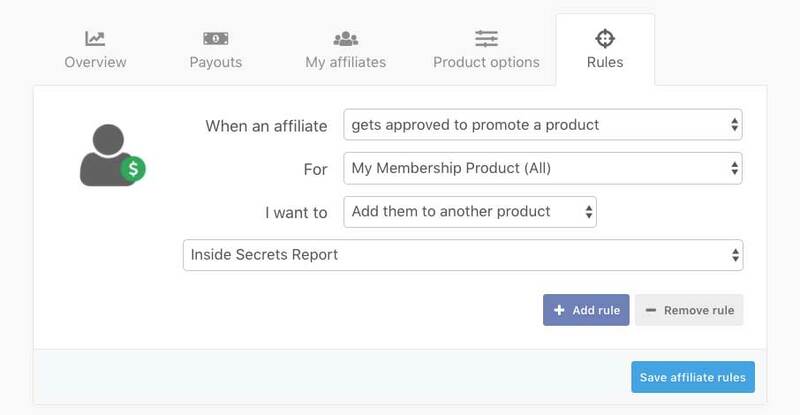 From your ThriveCart dashboard, you need to head to your Affiliates > Rules area. This area is INSANELY powerful and warrants it’s own article/video running through everything it can do, however in this article we’re simply going to create a rule that will add an affiliate to another product when they get approved signing up for ‘Product A’. To get started you’re going to want to click the Add rule button and you’ll see the initial rule template (it might look a bit different depending what integrations you already have added to your account. Something important to note is the difference between ‘signs up’ and ‘gets approved to promote a product’. If your product has manual approval required, but you select the trigger of ‘signs up’ it will automatically auto-approve the affiliate for the other product(s). So it’s best to use the ‘gets approved to promote a product’ trigger for this. The ‘signs up’ trigger is great for adding affiliates to your autoresponder. 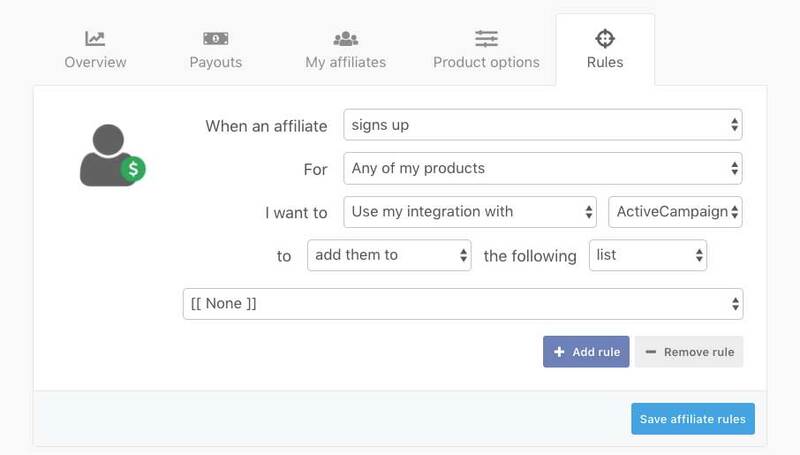 So you’ve created your rule to add Product B to the affiliate when they get approved for Product A, now you just need to do the same for Product C.
Click the add rule button again, and this time add the affiliate to the next product you want to automatically give them access to. Once you’re happy with your rules, click the Save affiliate rules button and you’re good to go! In this video, we look at automatically adding your affiliate to multiple products in your account when they sign up to one product. This video was filmed during a slightly older version of the UI so something may not appear exactly as they in your account today. In this example, we look at the situation where you may have multiple variations of a single product and want your affiliate to earn commission for each variation, no matter which the customer purchases.